Volume 2 (1900), Plate XXXIV, Figure 21. 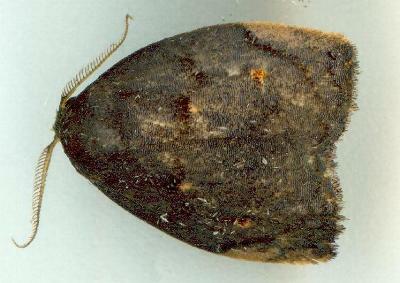 This species has adult moths have dark brown forewings with yellow patches, particularly on each costa near the wingtip. The hindwings are off-white. The wingspan is about 2 cms. Volume 2 (1900), p. 556, No. 1190 and also Volume 2 (1900), Plate 34, Figure 21. Volume 20, Part 1 (1899), p. 12.